An adult has 32 teeth made up of incisors, canines, premolars, molars and wisdom teeth. These different teeth are designed to do different jobs. Incisors are at the front and are the sharpest as they need to cut food. Canine teeth are in the corner as they are designed for tearing and grasping. Premolars are next and have a flat chewing surface and the molars at the back are bigger as they are for chewing and grinding before swallowing. An adult mouth will hold 8 incisors, 4 canines, 8 premolars, 8 molars and 4 wisdom teeth. Unless, of course, you’ve had any removed for some reason! Wisdom teeth usually appear at around 18 years of age but are often removed if they cause discomfort and displacement of existing teeth. The crown is the tooth as it appears above the gum line and what is seen when you smile. 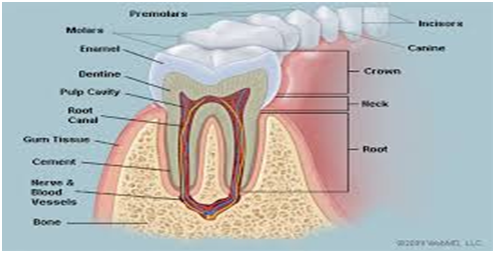 The root is below the gum line and is the largest part of the tooth but can’t be seen. According to the dentists, electric toothbrushes offer the best protection against the build up of plaque and are often considered better than manual ones, particularly if they have an oscillating head. Evidence suggests that after a 3 month period, using an electric brush led to a decrease in plaque by 21%. If you get one for Christmas, make sure you keep using it and don’t think it’s just a time to spoil your teeth but make it a lifelong commitment to avoid cavities and decay.